Mitchell, a former U.S. senator, peacemaker, author and Waterville native, will speak with Morning Sentinel reporter Amy Calder from 7 to 8 p.m. Thursday on stage at Lorimer Chapel at Colby College. 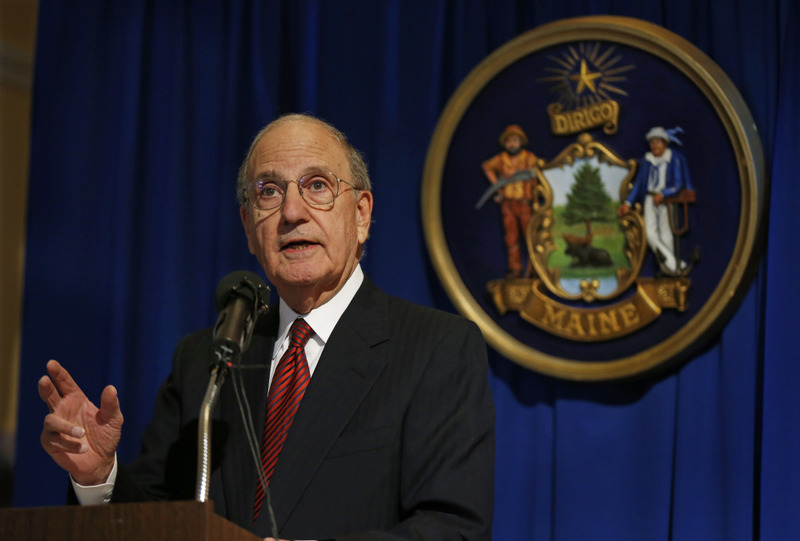 WATERVILLE — George J. Mitchell, the former U.S. senator, global peacemaker, author and Waterville native, will speak Thursday night at Colby College as part of the inaugural “Community Voices” event series. Mitchell, 83, will speak with Morning Sentinel reporter Amy Calder from 7 to 8 p.m. on stage at Lorimer Chapel at Colby. General admission tickets for the event cost $5 and tickets are free for newspaper subscribers, as well as Colby students and staff. Doors open at 6:30 p.m. and there will be a post-interview book-signing opportunity with Mitchell. The event series is presented by sponsors Colby College and the Morning Sentinel/Kennebec Journal, while Waterville Creates! and Central Maine Motors Auto Group are also sponsors. Calder covers Waterville, including city government, for the Morning Sentinel and writes a column, “Reporting Aside,” which appears Mondays in both the Sentinel and the Kennebec Journal. A Waterville resident, she has worked at the newspaper 29 years, including a stint as bureau chief for the Somerset County Bureau in Skowhegan, and has covered a variety of beats. A Skowhegan native, she holds a bachelor’s degree in English from the University of Hartford and completed post-graduate work in the School of Education at University of Massachusetts at Amherst. Mitchell was born Aug. 20, 1933, in Waterville, the fourth of five children, to Mary, a Lebanese immigrant and textile worker, and George, a janitor and the orphan son of Irish immigrants. The family lived at Head of Falls off Front Street before moving across the railroad tracks to a house at 94 Front St., when George was young. He graduated from Waterville High School in 1950, graduated from Bowdoin College, served in the U.S. Army counterintelligence corps and later earned a law degree at Georgetown University Law School before becoming a federal judge and U.S. attorney for Maine. A Democrat, Mitchell entered the U.S. Senate in 1980 and served until 1995, the last six as Senate majority leader. He led peace negotiations in Northern Ireland that resulted in the 1998 Good Friday Agreement for Peace in Northern Ireland. He also served as chairman of the Walt Disney Co. and was U.S. special envoy for Middle East peace from 2009 to 2011. He authored the Mitchell Report on the use of performance-enhancing drugs in baseball. Mitchell has written several books, including “The Negotiator” and “A Path to Peace,” the latter of which he co-wrote with Alon Sachar. In 1999, Mitchell was awarded the Presidential Medal of Freedom. “The Negotiator,” published in 2015, is the story of Mitchell’s life, from his modest beginnings in Waterville to a life of public service. The memoir also details his work negotiating peace in Northern Ireland and serving as U.S. special envoy to the Middle East. “A Path to Peace,” published last year, spells out in great detail the complicated history of troubles in the Middle East, describes years of turbulent relations between the Israelis and Palestinians and efforts to negotiate peace and makes recommendations for what needs to be done to help achieve it. Mitchell’s impact and name stretch across the Waterville area. For instance, the city’s George J. Mitchell School was named after him in 1995. Colby College hosts an annual “Senator George J. Mitchell Distinguished International Lecture Series,” which this year is April 17, with U.S. Sen. Angus King, I-Maine, delivering the lecture. Mitchell also has lauded Waterville’s “renaissance” involving a partnership between the city and Colby College, which has purchased several vacant downtown buildings and plans to build a boutique hotel and residential complex in the downtown.